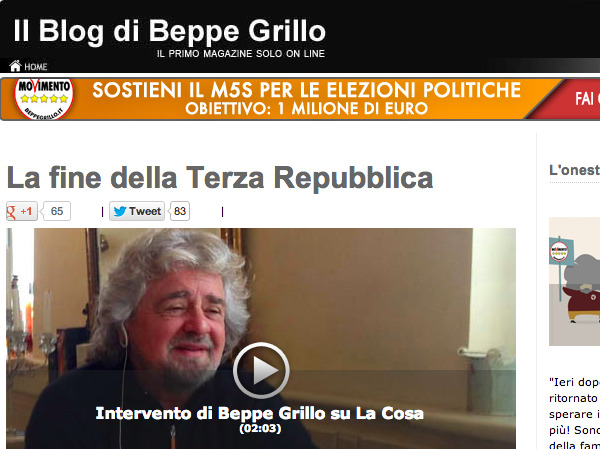 Rome, Italy — The actual outcome of the Italian election remains in doubt, but there’s no question who the big winner of the night was: Independent rabble rousing comedian Beppe Grillo.His party, the 5 Star Movement, took over 25% of the vote. And actually his party took a greater % of the vote than any other party in the lower house (however due to how coalitions work, he will not actually control the biggest block of seats). In addition to being a manifestation of anti-establishment anger, there’s another big story: The internet. You’ve heard a lot about how awesome Barack Obama’s campaign has done online. But they have nothing on Grillo, whose entire campaign was basically built on 3 employees, a blog, and a bunch of meetups among his fans. Back in January, The Guardian’s John Hooper profiled Roberto Casaleggio, the digital guru who turned Grillo’s blog into a political phenomenon. The M5S is pioneering “a new, direct democracy that will see the elimination of all barriers between the citizen and the state”. Like Julian Assange, Casaleggio combines unshakable confidence in his ability to interpret the impact of the internet with an air of boyish ingenuousness. The latter is particularly noticeable when he smiles to reveal a gap between his two front teeth. He first met Grillo “about 10 years ago” after the comedian read a book he had written. By then, Casaleggio was a successful information technology executive, former head of the Italian operations of the British firm Logica. In 2004, he founded his own company, Casaleggio Associati. The first step was the creation of Grillo’s blog, which by 2007 had become the seventh most popular in the world, even though written in the language of a country with less than a fifth of the population of the US and one in which fewer than 40% of households had a computer. In addition to the blog, there are Beppe Grillo meetups all around the world. Check out this list of 639 of them. It’s reminiscent of that first Howard Dean campaign, except Grillo is always screaming. 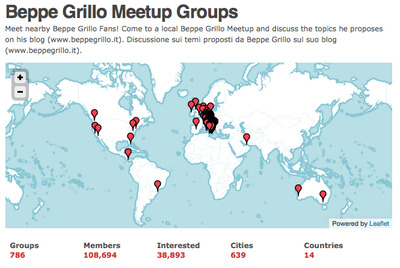 Grillo himself went around Italy in basically an RV with just a couple employees, drawing staggering crowds in each city he went to. He called it the “Tsunami” tour. Given the impact of yesterday’s election, that term was apt.